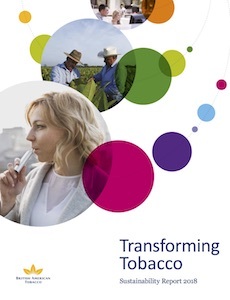 BAT’s continued investment in researching, developing and commercialising potentially less risky alternatives to cigarettes and information on these products, which we collectively refer as PRRPs – from vapour products, tobacco heating products, to modern and traditional oral products – which are now available in 29 countries globally. BAT’s continued commitment to sustaining a culture of integrity throughout the business including enhanced Third-Party Anti-Bribery and Corruption (ABAC) procedures and global Speak Up channels - for employees to report any concerns about potential unethical behaviour without fear of reprisal. BAT’s new carbon emissions reduction targets for 2030 as well as other targets to further reduce its environmental impact through reduced resource use, improved water stewardship and reduced waste. The new carbon targets have been set in-line with the Science Based Target Initiative’s methodology and BAT hope to soon gain formal approval. “I firmly believe that the approach we have taken in my tenure, integrating sustainability across all of our operations, will strongly support our transformation for many years to come and our sustainability agenda is a real source of personal pride.